I wear one myself when I am making jam, or any other time when I want to keep my clothes from getting splashed. I DO love aprons--particularly the lovely vintage types. My own mother, who is in her eighties now, never wore an apron, even though she was a housewife all my growing up years. My social worker "professional woman", paternal grandmother always DID wear an apron, so go figure that one out! I still have a couple of her aprons, although she's been gone since 1977. I think I shall start wearing an apron--they are so practical. Perhaps for some they are reminders of drudgery or dowdy, older women. I think that is why my mother never wore one. Thanks for the inspiration! .... until I get oil splashed across my front. Then I curse myself. You've convinced me -- I need to go put one on before I start the laundry. One for the dishes, one for baking, and one for the gardens. 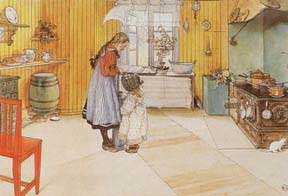 Love the image of the little mom with the girl in the old fashioned kitchen. I actually had a tin with that image on it during those 16 years waiting to become a mom. I have several aprons, but I have to admit that I don't wear them as often as I should. I usually put one on when I am cutting the children's hair as otherwise it ends up on my clothes and gets itchy and sometimes I will remember to put it on when cooking something messy. I will make more of an effort to wear my aprons from now on. When I went back to buy both patterns the following day, they were on sale for less than $3 a piece. If you're interested, I'd check out the site and maybe check back in a few days as they may show the sale price again if there is any interest in web hits. Even not on sale .. the price is a lot less than other vintage patterns .. and you can always shorten the apron .. but I rather like it in the longer length. I love aprons (I'll get back to the centre some time soon to make another). I have everyday ones, one for soapmaking and one for when guests are coming over - plus a waiters' half apron made of heavy dark material for working in the garden and doing demonstrations - with camera in the pocket too. I don't wear one every day, but on days when I'm doing a lot of batch cooking/baking, I always put one on. My favorite is made from a 1940's pattern that I'm going to have to trace out since I haven't found a similar pattern. What a lovely thought--the apron being our secret handshake! I usually wear full smock-type aprons when I'm doing housework. It's definitely useful for keeping my clothing clean, but I have to admit that I love the deep pockets for my iPod so I can listen to some music while I work and have my camera with me too. I wear an apron nearly every day...from morning till I get into my nightie! Keeps my clothes clean, and motivates me! I wear my apron! I have one with my name on it a friend purchased from a fancy kitchen store for me, but my most favorite is one made for me when I first married about 20 years ago by an 80 year old lady at my church. It has great pockets and I think of her every time I wear it. I have my tie-round-the-waist chef-style bibbed aprons for when I am baking - I look on it as wearing my Uniform! Just about midway down this post I am wearing an apron that my friend Margaret sent to me. I love it. I really need to make some friends for it, just haven't done it yet. My mother always wore an apron, as did both my grandmothers. Now you seldom see them except on blogs. p.s. Your profile photo is very lovely, too!!!! You know I was just thinking about this last week. I don't have an apron and I went to a friend's place for lunch and she popped on an apron and ever since then I've been thinking I ought to get one. I think I'll have to get one now! I always wear a cotton apron when cooking it not only protects my clothes but is also useful for wiping my hands. Mine are all no frills full aprons with a large pocket. It is always taken off when sitting down to eat. My grandmother always said it was slovenly to come to table wearing your apron. I often make them as gifts with the material specially chosen with the wearer in mind. After all they are more likely to wear one that has an appealing subject. I don't have an apron - yet! I am hopeless at sewing so I am going to ask my mother (who is great at it!) 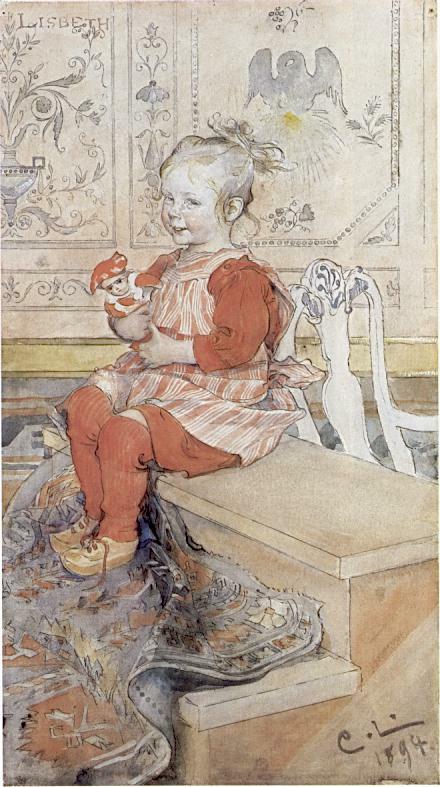 to make me one, and possibly a matching one for my daughter who is almost 2. I've only just discovered this blog but I'm so glad I did. My partner and I moved neighbourhoods recently and we now have a bigger backyard we want to utilise and build up to becoming a bit self-sufficiant, and it's so wonderful (and educational!) to read about other people making it work. Thank you for sharing it with us :) - Larissa from Melbourne. I have begun wearing an apron a lot more since I started baking bread regularly. Flour gets everywhere no matter what you do! And now that I'm baking and cooking so much more from scratch, I think I'll need to sew me up some more! Thanks for the links to How-to's. That will be so useful! When I put on my Apron, it tells me "time to be efficient"...I work really well and become quite creative! My food tastes better and I do a better job cleaning. I truly find your blog insightful and I am so glad I found it. Your view of life is awesome. I love wearing aprons. I just bougtht one from a friend's Etsy shop. Vintage 1950's - can't wait for it to get here!! i am not sure i can actually work without an apron! I've learned the hard way to wear an apron after getting greasy spots or splatters of tomato sauce on my clothes! I bought one a couple years ago while on vacation in Hawaii. It's bright yellow and purple flowers and the tie around the neck looks like a lei of flowers. Every time I wear it I remember my trip to Hawaii and the day I bought it! Plus it keeps my clothes clean! I highly recommend one!! I wanted to thank you for the apron blog - I found you when at Laura's blog - with the lovely pics of the aprons on it - I'll take a few pics of mine! I work as a gardener - and when I worked at a particular propagation place just me, another girl and the boss - the first day made me laugh - then contemplate - then think the man was a genius - all 6ft 4' of him - as we walked into the potting shed on the very first day - he gave us both an apron - we looked confused - we were there to pot up plants not cook. On the first day we could borrow his aprons - from then on in we had our own - simply brilliant - I always wear an apron in the garden when I'm working, especially potting up! Thank you for letting me share that - I might try and take a few pics and link to your blog - brilliant! My mum had a handy over-the-shoulder apron when I was growing up. She'd put it on especially for hanging out the washing. It had a big deep pocket she kept the pegs in. The only other memory I have of aprons is in my professional life. I was formerly a baker and cake decorator. My husband is still currently a chef. You would think we'd wear an apron at home out of habit, wouldn't you? Well, it's funny, because to wear an apron at home would remind us of our careers too much, LOL. We don't don the apron at home to remember we are at home. Aprons are handy and I do believe they can be enjoyed at home for the useful things they are. We always have a few in our cupboards just in case we want to do a mega cook-off that's going to be ultra messy. This will take you to a Celebrity Sewer's page - just scroll down to Amy Barickman and you will find the download link for the magic apron pattern. Very easy to make and the pattern is a diagram with measurements to draw up the pattern. I keep mine on a hook in my pantry cupboard ready to slip on when I need it. Planning on making a few for Christmas gifts. I always wear an apron for cooking and though I have made both my daughters and my Daughter-in-law one each and made one for a swap the 3 I own are not made by me. Think I'll remedy that and have a cruise through the links you kindly provided :). I know you're not big on fashion, but I have a divine Donna Hay apron that guess what? I always forget to wear it. I wore it while I prepared for the Little Miss' first birthday and haven't worn it since. Funny thing is every time my big little girl (3.5) helps me cook (on a daily basis) the first thing she does is put on her apron! Possibly the role playing concept you raised. I love the title to this post Rhonda. I sewed an apron a few years ago (my very first sewing project!! ), but seldom wear it--only for pastry, then I take it off again. I think an apron looks funny with pants, though. I would like to get into skirts, but have hated them ever since I was a tiny kid...and am having a hard time convincing myself that they're a good idea!! My sister gave me an apron several years ago and it sat in my linen press, unused for quite some time. Then one day, I was doing something in the kitchen in my best clothes and I grabbed it and put it on to protect me. I have used it ever since and recently bought another one while we were overseas. I think they are quite hard to come by. I will look over the patterns you have provided and maybe attempt making one myself. I don't wear an apron, but I have some of my grandmother's ones! I thought about your question, why don't I wear an apron. Well, I think it's because most of the time I don't feel I'm working, I think it is part of our new multi-tasking lifestyle. Flitting between different tasks, a little work then a little leisure. Putting on an apron would be all work. Does that make sense? Also, other than my bartending days, I've never seen peers use them. Though my dad used an oilskin one when BBQing. The other reason I don't wear one was before reading you article, I didn't truely understands it's role. Silly me, but I didn't realise it was there to get dirty, I thought it was for role-playing/ dress ups. The ones I see in shops are pretty 'special' pieces. Now I see that you wear it to get it dirty, to wipe your hands on etc. That sounds great to me! So guess what? Rhonda, I'm convinced, I'm going to Apron-Up. I love the idea of being in 'work mode' and then getting to take it off to sit and have a cuppa and do some knitting. Great comments; love the ideas of using a gardening apron and a laundry (pegs) apron. That's where I'll start. I have a couple aprons, but rarely remember to put them on. I keep them folded in my pantry, and I just forget about them most of the time. Usually it's my 2-year-old daughter who reminds me, because she wants to wear *her* apron to help with dinner, and then asks me to put on mine as well. Whenever I wear one, I always say to myself that I should wear it more often, as they're so handy. Guess I just need to get it in my head, and maybe try my hand at making a couple so I have clean ones on hand after I wear one. I wear aprons all the time, for the same reasons you mention. Have to keep a good supply in the pantry closet as they are forever in the wash.
My Grandmother always wore an apron while doing her housewor. My Mother never wore one. I don't, my oldest sister doesn't, but my sister next up from me does. Always...cooking cleaning, etc. I wonder if that has to do with being the middle child? I picked up other things that my Grandmother did. Quilting, sewing clothes, crocheting, baking breads. When I was younger, a handmade apron was a great gift for mums. It's a bit sad that not many mums wear that any more. My mum still wear it everyday but I don't. Only time I wear it is when I'm wearing a white shirt and cooking tomato pasta sauce. I love the warm feeling that my mum gives me when she wears an apron. There is something very motherly about it. What a great post!! I love aprons too, and just posted about it the other day here: http://quirkycooking.blogspot.com/2010/10/be-creative.html (There's a photo of me in my favourite apron.) Last Christmas my husband got a lot of flack from the ladies at work because he bought me a new apron for Christmas (a fancy one, which I asked for)! Funny how some people see wearing an apron and enjoying homemaking as demeaning - I don't! :) Love your blog! P.S. My daughter is making herself a t-shirt apron at the moment - have you seen this pattern? So cute!! I don't wear an apron. I've read blogs talking about the practicality of them and I can understand that and see the sense in them, BUT as a man who works full time and is yet still the main homemaker in my household I feel that I'm juggling to maintain my identity sometimes. That said I am thinking of making myself a more chefy type apron for when I'm baking bread. I always get flour on myself when I bake. The year our girls went off to college, I made them each half-aprons for Christmas that year out of Christmas fabric. It was my way of saying to them that we knew they wouldn't always be home for Christmas in the coming years but that was okay. They would, in time, make their own traditions and cook their own holiday meals. I have a full apron I wear when cooking and baking that I made out of this really fun bright blue fabric with geckos on it. When our oldest was home for a holiday this past spring she saw it and asked if I'd make her one too. So that's what she's getting for Christmas this year. I've made it reversible... Christmas fabric on one side, every day fabric on the other. I wear my aprons every day, though admittedly not all day long but only when I'm working in the kitchen. For garden work, I have "get dirty" clothes. I posted about aprons (or pinnies as we call them) in the summer. I like wearing aprons too. I typically only put mine on when I cook dinner, then I take it off to eat and put it back on to wash dishes and put the kids to bed. It makes me feel like I'm 'on the job'. I haven't put one on in the morning really, but maybe I should...I might keep a tidier house that way. I have an apron I wear in the kitchen whenever I cook, can or bake. It was made by my nephew in Home Econmics class. It is the least attractive, poorest constructed apron I have ever seen. But I think loving thoughts of him everytime I wear it. I've often noticed how many older TV shows had mom with an apron on in the kitchen (and sometimes all day). LOVE aprons! I wear a full-coverage apron both at home and at work at the health food store. My dear, dear gr-ma got me in the habit & my 1st apron was hers. I still have it...I'm 51 yrs old & it is probably older than me. It hangs in a corner of my kitchen & blesses my heart every time I see it. I always wear an apron while cooking, even when I am not dressed up for work. I like the feel of an apron, all mine have pockets making them a good way to carry a bit of produce from the garden, and they protect my clothes. I wear a full bib and skirt apron, I figure why protect only half of my clothes. I also wear an apron when I do storyhours, it has lots of pockets for the items I need for a story. I have had children ask me what that is that I am wearing, many mom's don't wear aprons anymore. I started wearing aprons when I was first married many years ago. A friend said to always put an apron on when coming home from work so that my good clothes would not be ruined while cooking dinner. I took her advice and have been wearing them ever since. I live in Portugal where most women wear tabards all day an all night (it seems!). I always have to do a double take when they take them off, as I don't recognize them!! Oh.. and sorry for the non translation! I'm in the minority here: I don't like wearing an apron at all. I've never seen one that looked the least bit appealing. I prefer a towel over the shoulder or on the counter when I'm in the kitchen to dry my hands. To date I haven't really felt a need for the pockets. Growing up my mom made an apron for me to use when I cooked with her, but I hated wearing it and she finally gave up trying to make me. I have just come out of 15 years in the hospitality industry and couldn't agree more about putting on an apron to start the day! I found this pattern and intend to try it - looks comfortable to wear as I hate the strap behind the neck. my former husband's grandmother made me a beautiful apron as a wedding gift. at the time, naive and ignorant as i was, i didn't appreciate what i viewed as an old-fashioned gift. why in the world would i want to spend time in the kitchen?! she's been gone many years now and i have new appreciation for her, her talents and her wisdom. the apron is worn in places, patched in others and has been used in the manner for which it was created. each of my children learned to cook wearing that apron and now, when my youngest grabs it to play house, carrying her baby dolls in it or running out to the yard to stuff the pockets full of berries or veggies or even snails, i understand. I love donning my aprons when I'm doing my housework. I have several of my own and I have made one for every lady in my family as gifts. I don't ever remember seeing my grandmothers or my mother wearing one, but I feel like I'm ready for work when I put mine on, like it's my uniform. I nearly always wear an apron when working around the house. And I've blogged it a few times :-). Just yesterday I dug out the Christmas apron :-). I love aprons too! They give me the power to be traditional. My down to earth life is in Italy, where the locals wear a dress-apron called a grembiule. Before I was 'enlightened' I never wore a grembiule. I used to wear the oldest torn, scrapy ill-fitting leftover clothing I could find and just abuse it in the garden. However, my elegant Italian neighbour wears her best (almost) clothes and just covers them up with a pretty grembiule. I have since purchased a few grembiuli for myself and now I find I'm in a half-decent state when friends drop in...rather than looking like a homeless workman! My grandmother always had on her apron, my mother never, myself never, but I do pin an old tea towel on when I bake. Need to re-think this situation. Oh yes, I wear an apron. I'm messy, honey! My grandmother always wore one - even to church! I think it was a German influence. She pinned the bib of the apron to her dress. She had house aprons and dressy aprons for "going to town" and for church. Sweet memories. Funny...I just read the post before mine, and realized perhaps her dressy apron was a grembiule! Maybe it was an Italian influence! Enjoyed your post. Hope you'll stop by Gail-Friends and sit a spell. I love my aprons.I have two every day ones, a half one I made which is a bit what you would call granny chic, I have amother I have made out of thin blue denim which I am waiting to use when we get chickens because of the fabric I have used for the front pocket I have one I always try and use when I am crafting as I made that one,too then I have a half apron hanging up which was a present from a friend and it just looks pretty hanging on the door! I love wearing my aprons. I have one for cooking and one for cleaning the bathroom and am in the process of making one for just wearing when home. What a lovely blog. I won't say inspiring (for me) as I concur with everything you say. I and both my daughters are 100% apron, enthusiasts. Come to our home no matter the time you will find us aproned. lol And, as for apron styles, we prefer what are often called vintage or retro aprons, but for us they are just aprons. Often called pinafore aprons or Edwardian aprons the ones we prefer are full and long to protect the style of dresses/skirts we wear. We have matching Girls/Ladies "Jewels" http://www.candleonthehill.net/store/catalog.php?item=40 pinafores which we really love to wear for church functions, and the "Edwardian" http://www.candleonthehill.net/store/catalog.php?item=266 apron is another favorite of ours. However we prefer cross back straps on that apron. Again, lovely blog.